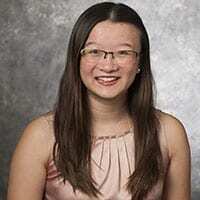 Junior Amanda Oh, the 2019 Larrie and Bobbi Weil Undergraduate Research Award Recipient. As the Weil Undergraduate Research Award winner, Amanda will receive a $500 prize and will have the opportunity for her paper to be published in the SMU Journal of Undergraduate Research. Amanda’s winning paper will be placed in the SMU Archives in DeGolyer Library, and in SMU Scholar, the university’s digital repository. Amanda will receive the Weil Award at Honors Convocation on April 15.